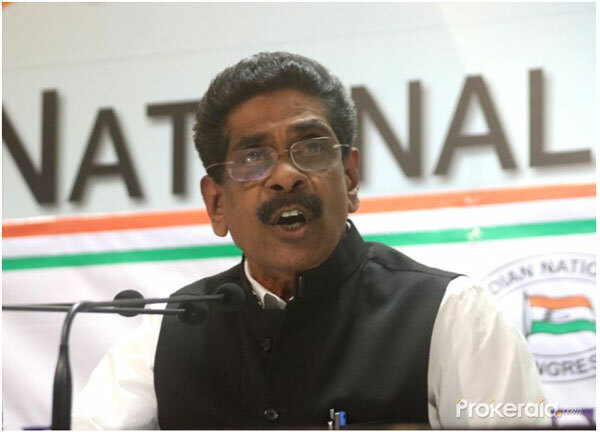 Sri Mullappally Ramachandran, Chairman Central Election Authority of INC is the Returning Officer for Congress President’s election. 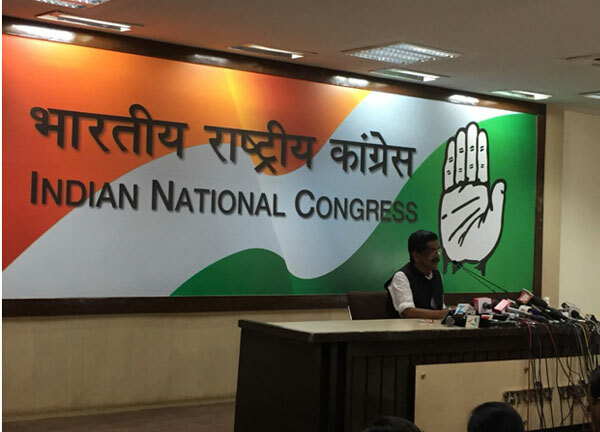 New Delhi: Congress leader Mullappally Ramachandran addresses a press conference in New Delhi on Dec 11, 2017. Rahul Gandhi, who is putting up a spirited campaign against Prime Minister Narendra Modi and the BJP in Gujarat, was on Monday elected the President of the Congress party taking over from his mother who had helmed the party for 19 turbulent years. Rahul Gandhi will collect the certificate formally declaring his ascension to the post on December 16, party’s central election authority head Mullappally Ramachandran told reporters. With great pleasure I welcome you to this important Media Meet. Today is an important day in the electoral process of Indian National Congress, 2017. The last day for withdrawal by candidates has ended today at 3PM. 89 Nomination papers proposing the name of Sri Rahul Gandhi for Congress President have been received. All Nomination papers have been found valid. 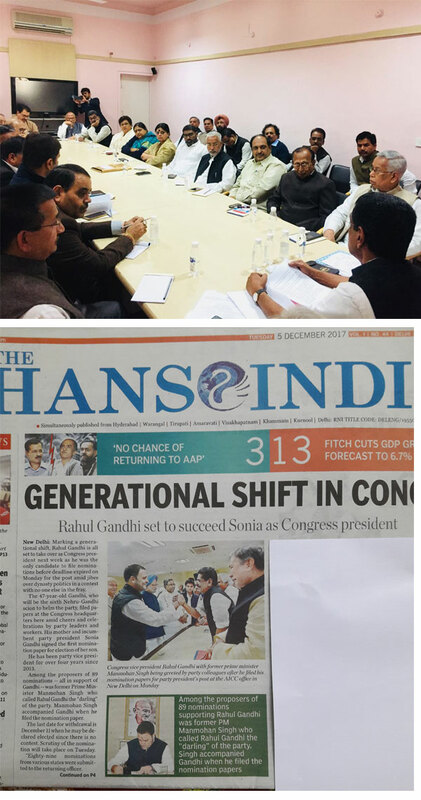 Since the withdrawal date and time is over and as there is only one candidate, as per Article XVIII (d) of the Constitution of Indian National Congress, I hereby declare Sri Rahul Gandhi elected as President of the Indian National Congress. This is a HISTORIC occasion. The handing over of certificate of election as Congress President is scheduled to be held on 16th December 2017 at 11 am on the lawns of AICC office, 24 Akbar Road. At the outset I complement each one of you assembled here for the positive support that you have extended to the Election Authority to complete the election process in a phased manner. We are happy to inform you that we were able to conform to the stipulated timeframe set by the Election Authority. This has been made possible by the Collective Effort of all concerned. We place on record the exemplary guidance and support given by Hon’ble Congress President Smt. Soniaji and Vice President Sri Rahulji. I recall with gratitude that at the first meeting of the Central Election Authority Madam Soniaji had given us only one mandatei.e to conduct free, fair and transparent election, keeping in view the high traditions and heritage of Indian National Congress. The only request that Soniaji placed before us was that women, weaker sections and youth should be given adequate representation. Rahulji is a stickler to Rules and he was very particular to conduct and complete the election process in a meaningful manner and as per the Constitution of Indian National Congress. I would like to bring to your notice that both Soniaji and Rahulji have never intervened in the functioning of the Election Authority. We were given complete liberty and freedom to accomplish our onerous responsibility. I am extremely happy that we, i.e. my colleague Members of the Central Election Authority- Sri MadhusoodanMistri MP and Sri Bhubaneshwar Kalitha MP and I, have been working in complete harmony. We have been able to proceed in a most cordial manner and all decisions have been taken by us jointly. Whenever any issue was brought to the notice of the Election Authority, we had diligently reached out to the Party cadres to address their grievances. I express my gratitude to both of them. We will be failing in our duty if we do not make a mention of the dedicated service rendered by the staff attached to the Election Authority. As you all know, Congress is the single largest Democratic Party in the world. From North to South, East to West, we have a minimum of hundred Congress activists or sympathizers in every village. To conduct organizational elections across the country is a huge, Herculean task. Millions of Congress workers actively participated in the process starting from booth level. I cannot forget the teeming millions who solidly stand behind Congress Party. The leaders of the various States and Union Territories and workers from grass-root level have all extended unstinted cooperation to make the election process a grand success. We, the Election Authority, gratefully remember the cooperation extended to us by senior leaders of various States. Everyone realized the importance of the election and rose to the occasion. They all realized that this is a very critical period through which our country is passing. They knew that with a united approach we would be able to forge the Party forward during challenging days ahead. Friends from the Media, both electronic and print, have had occasion to meet us in the Central Election Authority office. Whenever you required any information about the election process we had no hesitation to share it with you as we have nothing to hide. 42 PROs were deployed, supported by 71 APROs followed by 583 DROs. These officials were all from other States to ensure an unbiased and impartial election. PROs, APROs, DROs etc. have all put in their best efforts during the last few months. They have, by and large, proved their diplomacy and persuasive prowess. Altogether there are 8,86,358 Booth Committees, 9418 Block Committees and 930 District and City Congress Committees in various States and Union Territories. Everyone has worked in unison to complete the process. Elections were held in more than 80% of the booths as six states were facing Assembly elections. These States are Gujarat, Himachal, Karnataka, Meghalaya, Nagaland and Tripura. Before I wind up, with all humility at my command, I reiterate our deep gratitude to friends from the Media for your very positive support.